Sloucher: So how did the band form? Stella: Yeah and my brother used to be in Ad’s band. Lucy put an advert on MySpace saying they were looking for a keyboardist so I let them know I was interested and went along to practise and…that were that. Sloucher: Are you signed at the moment? Lucy: It was more of a licensing deal really just for them to release songs that we’d already recorded so just one album’s worth of songs, which we’ve done now. Sloucher: And what’s the benefit of that for you guys? Adam: Just a bit of a platform really, I mean it was a bit of a risk because the label (Thee SPC- Misky) do kind of twee indie stuff and we were quite different so…they took a bit of a risk with us and didn’t quite pull it off but still I think we got a lot of exposure which we couldn’t have done ourselves without a lot of hard work. Stella: They produced the CD for us and did all the packaging and everything, paid for all that. Lucy: It would have been quite expensive for us…but I just don’t think it opened as many doors as we maybe hoped it would do but I guess its pot luck with these things sometimes and we thought it was worth giving it a go anyway. Sloucher: So can you tell us a bit about your first album, Attack of the Pitching Machine (2009) I’m sure there is a funny story behind the name? Sloucher: Ah, we thought maybe it was a nod towards bands being D.I.Y. or something..? Adam: That never even occurred to me…we did use one (a pitching machine – Misky) so… (All laugh) only on slight bits though! Sloucher: How would you describe your music? Because I think that Cats:For:Peru are deceptively noisy myself! Stella: Yeah we just try new things out. Ad: And I do the two forefingers type of playing as well! Lucy: Yeah I’d like to think that we’re quite varied and we don’t just stick to one sound or style, we just kind of go with what we feel. Lucy: Lots of harmonies. But I guess it is very difficult to describe because each song is quite different. Sloucher: So, you’ve obviously got some new material gathered up. Is this a nod towards a new release then? Ad: We’d like to record them soon I think and we don’t want to rush into recording them like we have done in the past. I mean we’re not actively looking for someone to release them so it would probably be a sort of D.I.Y. thing but we’ve just got to decide how to do it, what format. Lucy: It is expensive to self-fund your recordings so it’s what you actually do with them that determines whether or not it’s worthwhile spending loads of money getting good recordings. Whether you are just going to sit on them or do something actively with them so it’s that toss up of what we would realistically do…so you know, we’ve definitely got stuff ready to record but we just don’t necessarily have to race back into the studio. Lucy: But I’m sure it will happen. Sloucher: Why did the band decide to release your double single, ‘Asleep in Monaco’ and ‘The Bearded One’ free online? Adam: Well, that was actually the label’s idea – the deal was just for an album but we obviously needed to promote it somehow and a downloadable single just seemed like the best way. We were kind of all in agreement at what songs we should use. Just then the interview is interrupted by the barman attempting to put the football on the big screen in the pub and failing miserably, as well as the arrival or Keith and Rich. Sloucher: You seem to be genre hopping between songs on the album which is great, but just as sort of a personal question, what’s your favourite song on the album? Lucy: I would probably say ‘Answers’ or I still really like ‘Cutting the Bridges’, that was like really early, one of the first songs we recorded. Stella: I swing between ‘Answers’ which is one of the quietest songs and ‘I Love You More Than Evolution’ which is one of the loudest songs on the album. Sloucher: And do you think the album turned out the way you wanted it to? Ad: It’s funny, we did three different sessions and then the label came to us and said ‘Do you want to release it?’ so we never had that album mindset until we did that. Rich: I think it came out well. I mean those songs were written almost a year apart and the album is just all those songs…a bit of a mismatch really I suppose. Stella: I listen to it! Ad: I really like the way it plays actually, I think we did well with the track list. Sloucher: One of things we’re interested in is whether people actually even listen to whole albums anymore or whether it’s based more around individual tracks because of iTunes etc. Do you think the ‘album experience’ is still important and relevant? Ad: I dunno, I think I do agree but then I also think back to CDs and when I didn’t like a song I would just skip it then. So it’s not mega important. Rich: I still listen to albums because I drive to Sheffield a lot and I’ve always listened to albums and I brought six new ones yesterday…so I still like them! Lucy: I still listen to lots of albums and I buy albums, I don’t download music, I always buy hard copies. Sloucher: How would you describe your live shows? Lucy: We try and pick our set list quite carefully, you know make sure there aren’t too many chilled out ones, make sure there’s enough rocky ones to lift the sound…otherwise you can get drowned out in some bars or whatever, depending on where you are playing and how drunk people are. Ad: We don’t have a band agenda to rock out. Sloucher: You’re playing Tramlines this year aren’t you? And you also played it last year? Lucy: Yeah we played it last year it was good. We had a late afternoon slot at The Harley and it was pretty busy, a good vibe. Sloucher: What about the music scene in Sheffield, what do you think? Ad: Good excuse! I don’t live here either so I might as well use that excuse too! Lucy: I mean, I thought the ‘2Weeks 2MakeIt’ competition was quite an eye-opener in terms of just how many good local unsigned bands there are and I thought the videos were fantastic, I was really impressed. But in terms of picking out individual bands…I dunno. Sloucher: Fair enough! So the band was featured in a documentary? Ad: Yes, it was called ‘Regeneration Song’ and it was made by a friend of ours Ed from Sort Of films, yeah it’s about Stag Works, he just asked us when we were there and would you mind if we came down for a day and did a bit of filming? It turned out very good. Sloucher: (to Lucy) How long have you been drumming for? We know from previous chats that a lot of female drummers seem to get some prejudice directed towards them…? Lucy: And I can’t imagine being in an all-female one either! (Laughs) And it works nicely for the harmonies as well, you know Keith, Stella, and Ad’s voices work well together. Sloucher: What are your personal influences as musicians? Ad: We all have very different ones, put it that way! Stella: I thought you were going to say Jay-Z then! Ad: There are bands out there that all like Oasis, and then they just sound like Oasis, but because we all like different things hopefully we’ll never end up sounding too much like any one band…touch wood. Although a lot of people say we sound like Radiohead! Ad: Yeah! As long as everyone doesn’t think it then it’s ok. Elbow, we get a lot, Guillemots we get a few times, Pixies for the whole dynamic thing, which I can see…we don’t sound like them though. Ad: In the same sentence! Sloucher: We don’t like comparisons but at push we thought maybe Electric Soft Parade? Ad: Yeah they’re a bit like Doves aren’t they? Sloucher: And what’s in store for the band in the future? Lucy: Have you seen it? Did you like it? Keith: Yeah I think a video is a good way to get people to listen to our music, and we got a lot of exposure from the ‘2Weeks 2MakeIt’ competition. Ad: Yeah I’ve found with this video that a lot of people are watching it and saying ‘Oh I really like your band’ and they’ve obviously never listened to us before! Lucy: We might even do more with that animator too; we’ve hopefully got a good relationship with them now. We might also try and get some support slots for up-and-coming bands and things, which could open some more doors as well. Sloucher: Are you releasing anymore singles off the album? Ad: No, I mean we’ve got ‘Answers’ obviously and we’ll promote that video separately. We’ll also still be promoting the album, selling it at gigs but I think we’re ready to do new stuff now. Doing new stuff also helps to promote the old stuff too. 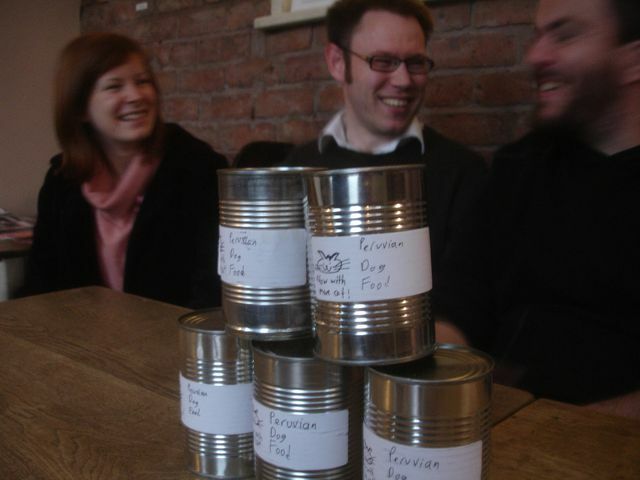 As the interview draws to a close and Sam produces several tins marked with homemade labels, ‘Peruvian Dog Food’ for the photos (as homage to the new video) I am struck by what a pleasant bunch of people the band are. There is no ego or front here, and it’s obvious that Cats: For:Peru are open to new experiences and directions as a band which I hope will make for an exciting future and I hope they find some way of getting their music out to a broader audience. For now though, it’s off to rehearsal for the band and back up the hill into Crookes for me and Sam – via Tesco’s of course…I feel it’s time for more cake. 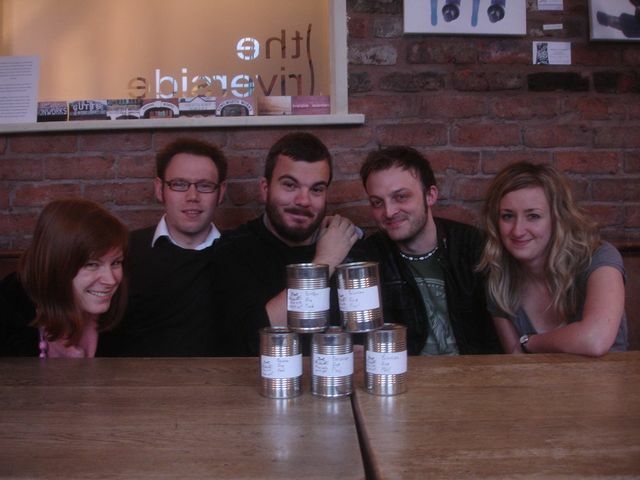 Catch the band live THIS FRIDAY 21.05.10 @ The Grapes (from 8pm) and @The Harley on 06.06.10 and @Soyo on 28.06.10. Get a free Cats:for:Peru song in our even free-r mix cd! Click here. Links: Website. Facebook. Myspace. Twitter. Free tracks. Posted in Good times at Sheffield, Interview, InterviewsTagged 2Weeks 2MakeIt, Asleep in Monaco, Attack of the Pitching Machine, Cats:For:Peru, Smokers die younger, Thee Sheffield Phonographic CorporationBookmark the permalink. Love love love love the interview and can’t wait for Friday!!! Thanks for the interview guys, t’was most fun!